Craig Biggio was the best position player in Houston Astros' history after spending his entire career with the team and capturing many team records. 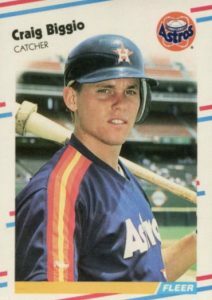 Making his MLB debut during the summer of 1988, the first major league Craig Biggio baseball cards can be found in '88 products. This list features some of the best Craig Biggio card appearances including minor league, rookie and autograph cards. 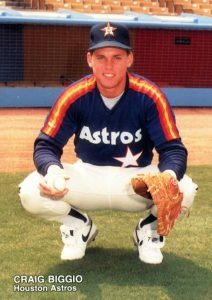 Selected by the Astros in the first round of the 1987 draft, Biggio would spend a little more than a year in the minors before getting the call to the big leagues. While he found early success as a catcher, winning a Silver Slugger award and earning an All-Star nod at the position, he would be shifted to second base to take advantage of his speed and avoid the knee problems that frequently plague backstops. As a result, Biggio became the only player in baseball history named an All-Star at both catcher and second base. Shop for Craig Biggio autograph cards on eBay. Biggio and his teammate Jeff Bagwell earned the nickname "Killer B's" as the duo helped the Astros to multiple playoff appearances. This includes reaching the postseason six times from 1997 to 2005, and a trip to the World Series in 2005. Collectors can find many combination autographs for the pair along with additional "B's": Lance Berkman, Derek Bell, and Carlos Beltran. Among the choices, Biggio and Bagwell had dual autograph cards in 2016 Topps Museum and it is Biggio, Bagwell and Berkman with a triple signature in 2006 Ultimate Collection. A six-player autograph in 2005 Ultimate Collection might be the greatest Astros team card ever made as it has autographs from Biggio, Bagwell, Berkman, Roger Clemens and Roy Oswalt. 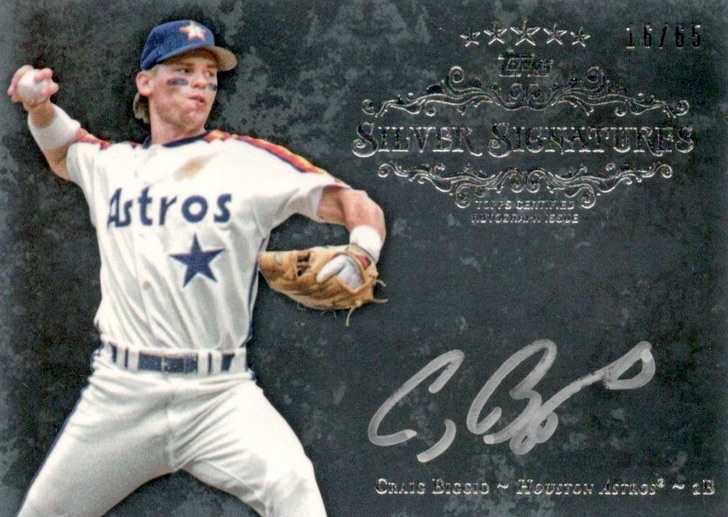 Recognizing the recent resurgence of the Astros, Biggio was featured with Astros shortstop and 2015 Rookie of the Year Carlos Correa on a dual autograph in 2017 Topps Tribute. While several rookie and prospect cards make the cut, there are a few other early Biggio cards to add to your collection. A 1988 pre-rookie card made by CMC highlights Biggio's time in the Pacific Coast League. 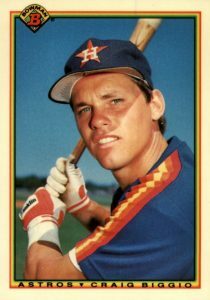 Although the earliest MLB cards for Biggio came in two 1988 update sets, other Craig Biggio rookie cards can be found in 1989 Donruss, Fleer, and Upper Deck. As a baseball star of the 1990s and 2000s who retired without any steroid rumors tarnishing his career, Biggio was one of the most beloved players of his day. Despite this, and a Hall of Fame induction in 2015, Biggio remains a very affordable player to collect. With that in mind, the following list identifies ten notable Craig Biggio cards. Value was a main focus in card selection along with highlighting cards from the beginning of his career. If you weren't paying close attention in the late 1980s, you might not have noticed that Bowman released limited-edition Tiffany sets just like their Topps flagship counterparts. 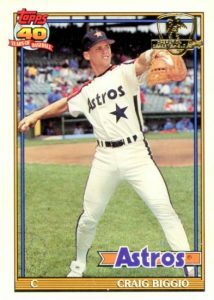 The 1990 version, featuring the portrait card of Biggio wearing his Franklin batting gloves, had about 10,000 sets produced. 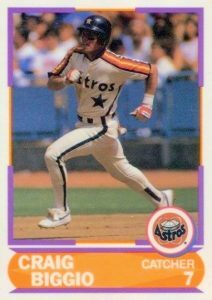 Biggio wasn't included in the 1989 Bowman series which totaled around 6,000 Tiffany sets. However, fans looking for a Biggio card with a 1989 Bowman design can find one in 2014 Bowman that utilizes silver foil. Mother's Cookies sponsored sets for several teams in the 1980s and 1990s. Provided as a game giveaway, the Astros' 1989 set totals 28 cards. The small release is particularly appealing for team collectors as it features lesser-known subjects not found in other sets. Part of the Astros giveaway on July 22, 1989, Biggio is shown in the catcher's stance with his glove. Biggio is also found in later Mother's Cookies editions. Craig Biggio's card in 1991 Topps Desert Shield displays the famous palm tree stamp in gold foil. The back mentions that Biggio led all catchers with 25 stolen bases in 1989. He would rack up an impressive 414 stolen bases over his career. While this is the premium version of his 1991 Topps card, there is also a Tiffany edition. Biggio did not appear in the first certified autograph sets of the 1990s, so collectors had to wait on pack-pulled signatures. Although 2000 SP Authentic provides his first autograph, many gravitate to his more recent options. A particularly nice example came in 2013 Topps Five Star as Biggio signed in silver on a marble-like background. His autograph is memorable because his first name is often signed with a large capital "C" and then a comma that represents the rest of "Craig." 1989 Topps contains a popular Craig Biggio rookie and the Tiffany version is the preferred edition to collect. The glossy cards printed on white card stock were limited to only 15,000 to 25,000 sets. While this is a high number in today's market, it is still a much, much lower amount than his other 1989 cards in Donruss, Upper Deck and Fleer. 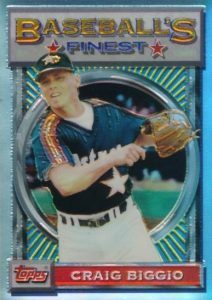 The Refractor parallels in 1993 Topps Finest continue to be some of the most valuable cards of the decade. Biggio is featured throwing to first base after a defensive play with the appropriate moniker of "Baseball's Finest" above his head. A leadoff hitter for much of his career, he set the National League record with 53 leadoff home runs. The two 1989 Score Young Superstars sets were available to collectors through a write-in offer that asked them to send in wrappers from the flagship Score product. While the first series didn't include any notable cards, Series 2 offers early appearances of both Biggio and Ken Griffey Jr. In total, there were 42 cards in Series 2 and each card had a glossy finish much like the Tiffany sets from Topps. 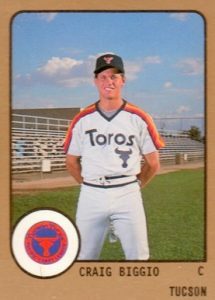 The key pre-rookie for Biggio is his 1988 ProCards release with him sporting the jersey of the Tucson Toros. After being draft in 1987, Biggio only spent 141 total games in the minors before being called up permanently to the majors. 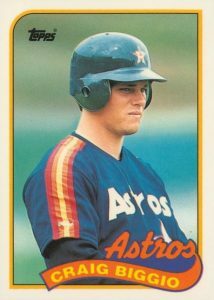 The Turos were the Astros AAA-team where Biggio spent over half his minor league games. The first of two cards that feature Biggio as an Astro before his major league debut can be found in 1988 Fleer Update. Just like the regular 1988 Fleer set, the company issued a special glossy version of Update that could only be purchased as a complete set. At the time, Biggio was still a single-A prospect with the Asheville Tourists out of North Carolina. 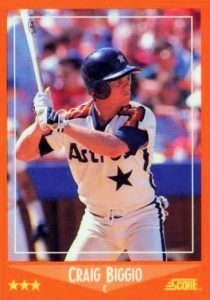 With a reported print run of just a few thousand copies, the most limited Craig Biggio rookie is part of the 1988 Score Traded Glossy set. The update to Score's premiere release, gem-mint copies of the glossy card can reach prices near $300. Biggio is pictured at the plate waiting for a pitch that, over the course of his career, ended up hitting him 285 times, which is the second most all-time. RARE 1991 Topps BOLD 40th Anniversary Glow Back Baseball Cards #1-792 You Pick!